1. 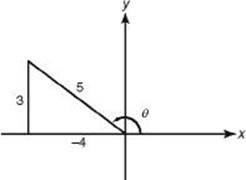 (A) Reference angle is 40°. Cosine in quadrant IV is positive. 2. (D) See corresponding figure. Therefore, sin . 3. 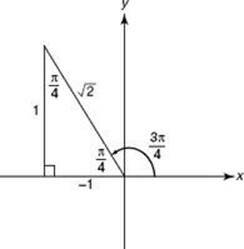 (D) Angle is in quadrant II since sec < 0 and sin > 0. Therefore, tan . 4. (A) Cofunctions of complementary angles are equal. 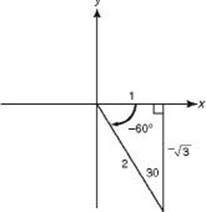 x – 30 + x = 90 finds a reference angle of 60° for x. The angle in quadrant III that has a reference angle of 60° is 240°. 5. (A) Angle is in quadrant II, and sin is positive. Angle is in quadrant IV, and sin is negative. * 6. (E) Put your calculator in degree mode, cos 310° + cos 190° 0.643 + (–0.985) – 0.342. Checking the answer choices shows that –cos 70° –0.342. s = r ≈ 1(0.7) ≈ 0.7. * 5. (C) Change 25° to 0.436 radian . s = r , and so 12 = r(0.436) and r = 27.5 inches. 1. (A) Sketch a –60° angle in standard position as shown in the figure below. 2. (C) Sketch an angle of radians in standard position, as shown in the figure below. The cosine ratio is . In a quadrantal angle r = 1, and the cosecant ratio is , which is undefined. 1. (C) Period . Point P is of the way through the period. Amplitude is 1 because the coefficient of sin is 1. 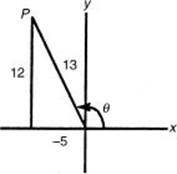 Therefore, point P is at . 2. (E) Amplitude = . Period = . Graph translated unit up. Graph looks like a cosine graph reflected about x-axis and shifted up unit. * 3. (C) Graph 4cos using ZOOM/ZTRIG and observe that the portion of the graph between is decreasing. * 4. (C) Graph the function and determine its maximum (2) and minimum (–2). Subtract and then divide by 2. 5. (D) Period = . * 6. (C) Graph the function using 0 for Xmin and for Xmax. Observe that the maximum occurs when x = . Then . * 1. (A) sin 2x = 2 sin x cos .
2. (D) Since tangent and cotangent are cofunctions, tan A = cot(90° – A), so B = 90° – A, and A + B = 90°. 4. (A) sin 74° = 2 sin 37° cos 37°. Since . Since 74° is in the first quadrant, the positive square root applies, so cos .
* 6. 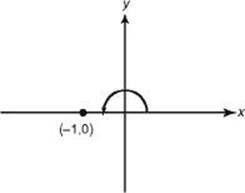 (A) Graph y = sin x and y = cos in radian mode using the Xmin = 0 and Xmax = . Observe that the first graph is beneath the second on [0,0.79]. 7. 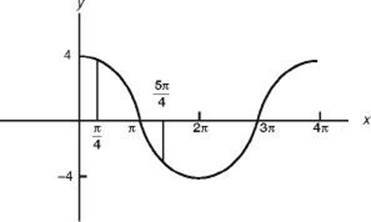 (D) Remember that the range of the sine function is [–1,1], so the second term ranges from 6 to –6. * 1. (E) Set your calculator to degree mode, and enter 2nd sin–1 . * 2. (D) Set your calculator to radian mode, and enter 2nd cos–1(–0.5624). * 3. (B) Set your calculator to degree mode, and enter 2nd tan–1(tan 128°). * 4. (E) The range of inverse cotangent functions consists of only positive numbers. 5. (A) Since , I is true. Since cos–11 = 0 and cos–1(–1) = , II is not true. Since the range of cos–1 is [0, ], III is not true because cos–1 can never be negative. 6. (E) 3x = arccos , and so x = arccos . 1. (D) Law of Sines: . The figure shows two possible locations for B, labeled B1 and B2, where m AB1C = 45° and m AB2C = 135°. Corresponding to these, m ACB1 = 105° and m ACB2 = 15°. Of these, only 15° is an answer choice. * 2. (E) By the Law of Sines: . The figure below shows this to be an ambiguous case (an angle, the side opposite, and another side), so or C = 180° – 41.81° = 138.19°. 3. 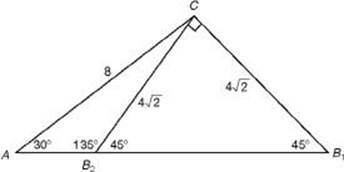 (A) The angles are 15°, 45°, and 120°. Let c be the longest side and b the next longest. * 5. (C) Law of Cosines: d2 = 36 + 64 – 96 cos 120°. d2 = 148. Therefore, d 12. 6. (D) Altitude to base= 8 sin 60° = 4 . Therefore, 4 < a < 8. * 7. (D) A = 45°. Law of Sines: . Therefore, a = 10 14. 8. (D) Area . Therefore, C = 60° or 120°. 9. (C) Area . C = 60° or 120°. Use Law of Cosines with 60° and then with 120°. Note: At this point in the solution you know there have to be two values for C. Therefore, the answer must be Choice C or E. If C = 10 (from Choice E), ABC is a right triangle with area = · 6 · 8 = 24. Therefore, Choice E is not the answer, and so Choice C is the correct answer. 10. (A) In I the altitude and so 2 triangles. so only 1 triangle. In III the altitude so no triangle.